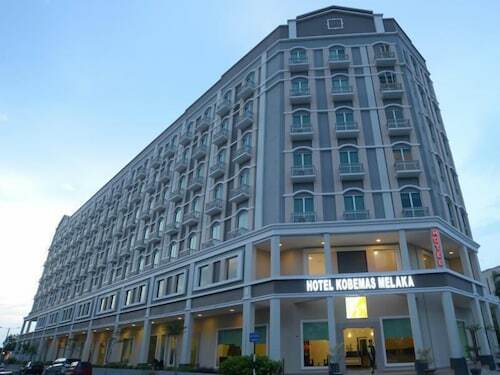 Located in Bukit Baru, this hotel is within 3 mi (5 km) of Multimedia University, Malacca Zoo, and Pantai Hospital. The Shore Oceanarium and Red Square are also within 9 mi (15 km). A restaurant, a snack bar/deli, and a business center are available at this hotel. Free WiFi in public areas, free self parking, and a free manager's reception are also provided. Other amenities include a meeting room, concierge services, and a 24-hour front desk. All 165 rooms offer free WiFi, room service, and flat-screen TVs with cable channels. Other amenities available to guests include coffee makers, free bottled water, and hair dryers. Housekeeping is available once per stay. The hotel offers a restaurant and a snack bar/deli. Each day guests can enjoy a complimentary manager's reception. Public areas are equipped with complimentary wireless Internet access. This hotel offers access to a business center and a meeting room. For a surcharge, a roundtrip airport shuttle (available 24 hours) is offered to guests. This business-friendly hotel also offers a terrace, multilingual staff, and concierge services. Onsite self parking is complimentary. Hotel Kobemas Melaka has a restaurant on site. Rollaway/extra beds are available for MYR 70.00 per day.